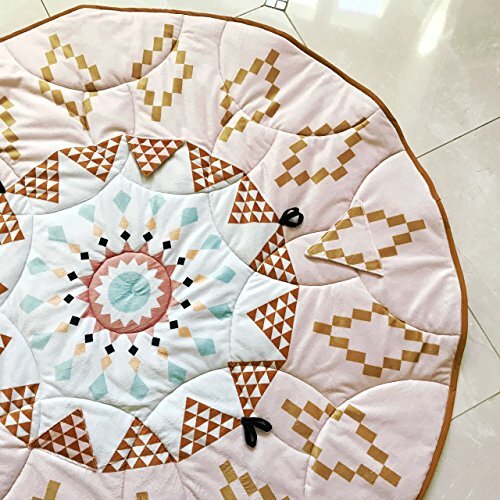 Round padded baby play mat never looked so good! We have reinvented the traditional baby play mats to look stylish, compliment the aesthetic of your home, be comfortable and safe, and most importantly last you a long time. This particular design is our Exclusive, and features modern geometric pattern in a mosaic-like manner. SIZE: Diameter 48" CONSTRUCTION: Top fabric - soft and snuggly minky with our exclusive design. Bottom fabric - solid grey cotton canvas. Middle layer - 3/4" thick hypoallergenic polyester, won't yellow, won't fall apart, won't mildew. Completely handmade using USA materials, compliant with strict CPSC regulations. SPECIAL FEATURES: The mat features 4 crinkle flaps that hide a cute illustration behind them. There are a few loops throughout the mat area so that you can hook up your favorite toy or a pacifier. There is 1 central loop on the backside so that you when you done playing or want to clear the floor, you can simply hang the mat on a hook ( it folds into a pizza slice shape). There are 3 special hanging loops on the side of the mat meant for displaying the mat on the wall. The mat is top stitched all over for durability, and to keep the batting in place. USE: There are so many other uses besides the baby play time. Throw it on your favorite armchair for extra padding and pop of color! Place it by the toddler bed as a an adorable area rug. Add some throw pillows and create a cozy reading nook in the corner. Use it in your kids Teepee for padded cushioning. Use the loops on the side and hang it above a crib/toddler bed as a really cool art piece. CARE: Machine washable for hassle free maintenance. If you have any questions about this product by NewMomDesigns, contact us by completing and submitting the form below. If you are looking for a specif part number, please include it with your message.